If you want an eye-catching rose that is truly unique, Hot Chocolate is the one for you! Vivid, burnt-orange flower buds open up into incredible smoky chocolate-brown blooms. 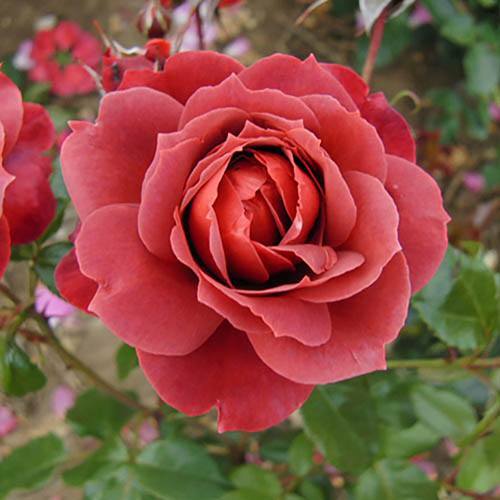 Each flower is accompanied by an intense old-rose fragrance that will fill the air! Winner of the RHS Award of Garden Merit, very easy to grow and disease resistant. Supllied as 3L potted plants. If you want an eye-catching rose that is truly unique, Hot Chocolate is the one for you! Its vivid, burnt-orange flower buds open up into incredible smoky chocolate-brown blooms against its large dark green foliage. Each flower is accompanied by an intense old-rose fragrance that will fill the air! This rose is very easy to grow and disease resistant so despite looking exotic, its perfect for beginners! Height 75cm x 45cm, it has big flowers to 10cm across, and a great fragrance too. Winner of the RHS Award of Garden Merit, it is always popular and sells out, so please order early.